Using a variety can reveal robust product embodiments. 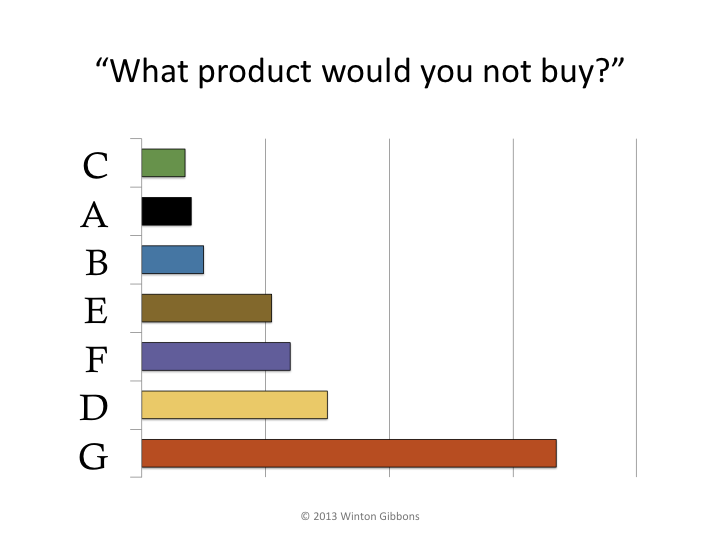 In this context, this essay discusses a real example of 7 product ideas (diagnostic tests). Often, companies are faced with choosing from a variety of embodiments for product concepts. Many times, market research is performed in order to sort through these. This can be done through qualitative interviews, or focus groups. It can also be done using quantitative techniques. While there are many reasons to recommend one specific method over another, each has weaknesses. Triangulation can over comes these. In order to best illustrate the need for triangulation when looking at product concepts, a real-world example is likely best. 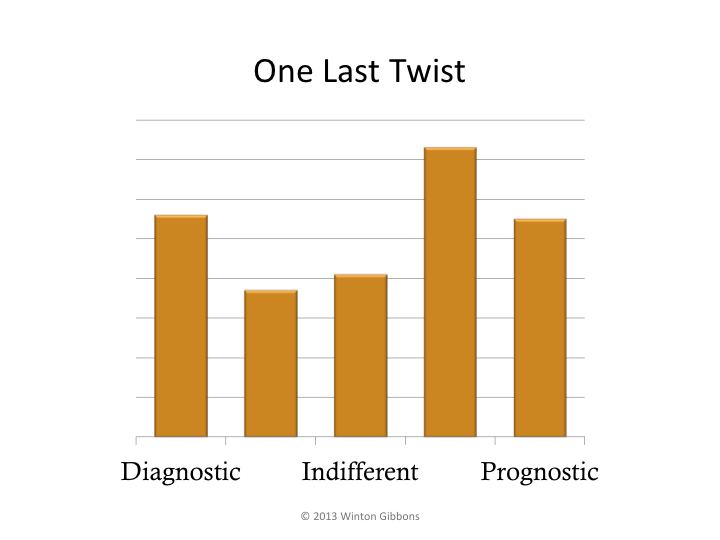 Scale – Physicians were asked on a (Likert) scale, how much they liked a concept in isolation. 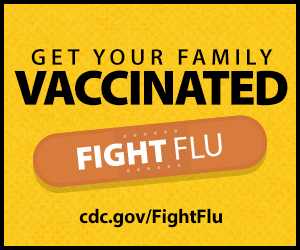 Rank, or assign points | percentages – Doctors prioritized the complete set of ideas. Conjoint analysis for utility – MDs ranked various prototypes chosen specifically to identify the utility of various individual attributes of potential concepts. 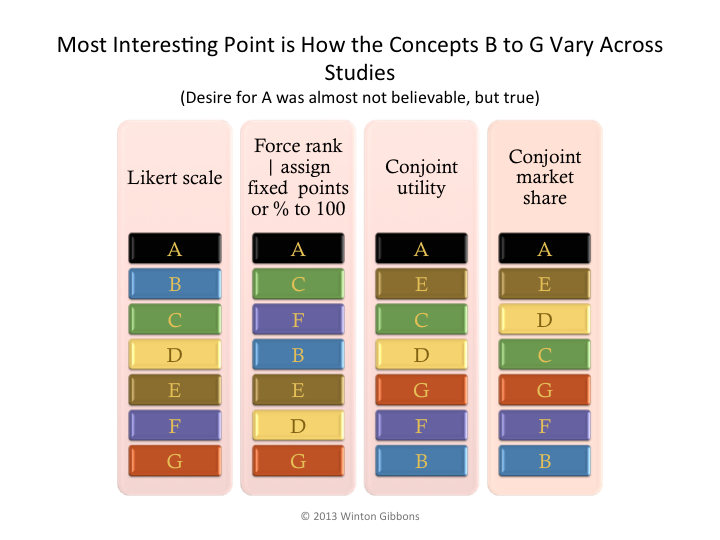 Conjoint analysis for market share – The resulting utilities was also compared to competitive products, leading to estimates of market share. Negative preference – Physicians were asked what they would not use. The figure shows that the rankings varied greatly across method, except from product concept A. Specifically, using one or the other method, either B or E could have been chosen as a product, especially if A had development issues. But neither B nor E is robustly wanted. Instead, C would be the best back up idea. An often not asked question backs this up. It is useful to find out what the customer would not use, as shown in next figure. Moreover, there are not just market expectations, but for real-world products, limitations or additional features (e.g., to meet unspecified needs rather than desires). Also, competition and competitive response need to be incorporated. 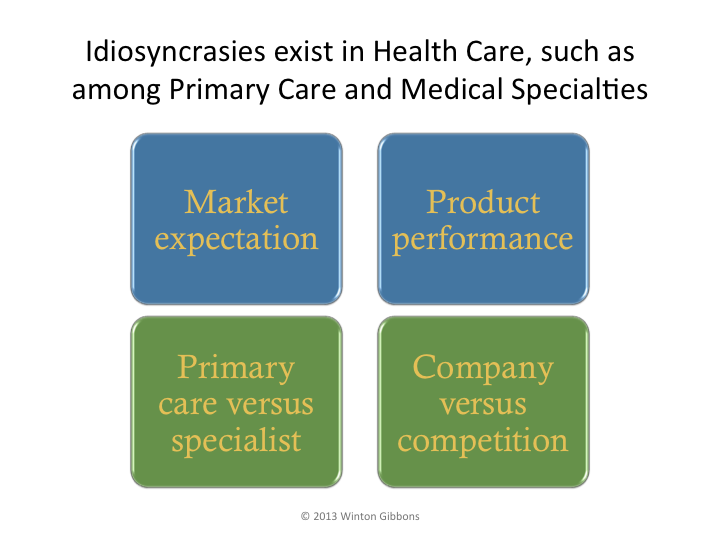 To complete the example, idiosyncrasies also exist in Health Care, such as among primary care and medical specialties. When analyzing the desired products by one quantitative aspect, diagnostic versus prognostic assay, there appeared to be little preference. 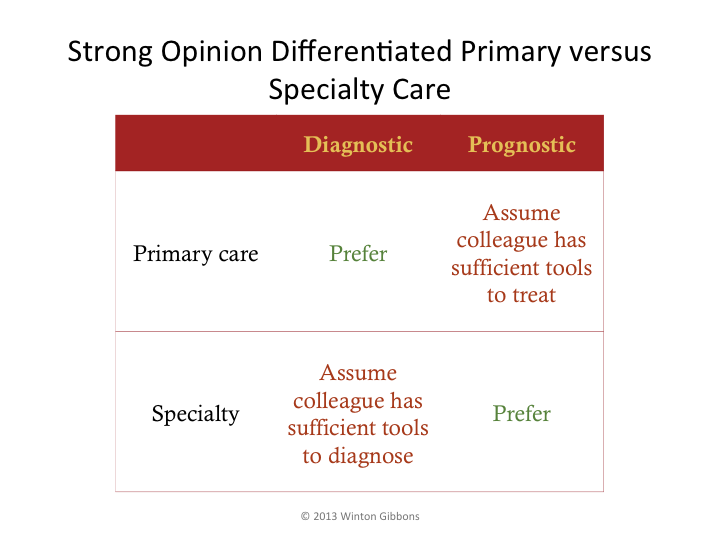 However, during focus groups | subsequent follow-up, strong opinion differentiated primary versus specialty care. Importantly, the conflict showed that the respect for the other type of physician was driving these differences in appeal. There was a strong perception that the other type of MD already had sufficient tools and capabilities. Therefore, they did not need another diagnostic tool. For more than a few product concepts, the actual example laid out above is the norm. Triangulation is the solution.